• Kotsias G, Lolis CJ. 2017: A study on the total cloud cover variability over the Mediterranean region during the period 1979-2014 with the use of the ERA-Interim database. Theoretical and Applied Climatology (in press). • Lolis CJ. 2017: A climatology of convective available potential energy in the Mediterranean region. Climate Research (in press). • Gatidis C, Lolis CJ, Lagouvardos K, Kotroni V, Bartzokas A. 2017: On the seasonal variability and the spatial distribution of lightning activity over the broader Greek area and their connection to atmospheric circulation. Atmospheric Research (in press). • Ioannidis E, Lolis CJ, Papadimas CD, Hatzianastassiou N, Bartzokas A. 2017: On the intra-annual variation of cloudiness over the Mediterranean region. Atmospheric Research (in press). • Tsabouri S, Gkoutsias A, Lolis CJ, Makis A, Chaliasos B, Bartzokas A. 2017: Impact of meteorological factors on the emergence of bronchiolitis in Northwestern Greece. Allergologia et Immunopathologia (in press). • Lolis CJ, Turkeş M. 2016: Atmospheric circulation characteristics favoring extreme precipitation in Turkey. Climate Research 71: 139-153. • Hatzianastassiou N, Papadimas CD, Lolis CJ, Bartzokas A, Levizzani V, Pnevmatikos J, Katsoulis V. 2016: Spatial and temporal variability of precipitation over the Mediterranean Basin based on 32-year satellite Global Precipitation Climatology Project data. Part-II: inter-annual variability and trends. International Journal of Climatology 36(15): 4755-4766. • Hatzianastassiou N, Papadimas CD, Lolis CJ, Bartzokas A, Levizzani V, Pnevmatikos J, Katsoulis V. 2016: Spatial and temporal variability of precipitation over the Mediterranean Basin based on 32-year satellite Global Precipitation Climatology Project data. Part-I: evaluation and climatological patterns. International Journal of Climatology 36(15): 4741-4754. • Dafis S, Lolis CJ, Houssos EE, Bartzokas A. 2016: The atmospheric circulation characteristics favoring snowfall in an area with complex relief in Northwestern Greece. International Journal of Climatology 36(10): 3561-3577. • Gaitanis G, Lolis CJ, Tsartsarakis A, Kalogeropoulos C, Levidiotou-Stefanou S, Bartzokas A, Bassukas I. 2016: An aggregate of four anthrax cases during the dry summer 2011 in Epirus, Greece. Dermatology 232(1): 112-116.  Serbis E, Lolis CJ, Kassomenos PA. 2015: Atmospheric circulation characteristics associated with daytime extreme static instability over Athens, Greece. Climate Research 64: 111-122.  Gkikas A, Houssos EE, Lolis CJ, Bartzokas A, Mihalopoulos N, Hatzianastassiou N. 2014: Atmospheric circulation evolution related to desert dust episodes over the Mediterranean. Quarterly Journal of the Royal Meteorological Society 141(690): 1634-1645.  Efstathiou GA, Lolis CJ, Zoumakis NM, Kassomenos P, Melas D. 2013: Characteristics of the atmospheric circulation associated with cold season heavy rainfall and flooding over a complex terrain region in Greece. Theoretical and Applied Climatology 115(1-2): 259-279.  Bartzokas A, Lolis CJ, Kassomenos P, McGregor GR. 2013: Climatic characteristics of summer human thermal discomfort in Athens and its connection to atmospheric circulation. Natural Hazards and Earth System Sciences 13: 3271–3279.  Efstathiou GA, Zoumakis NM, Melas D, Lolis CJ, Kassomenos P. 2013: Sensitivity of WRF to Boundary Layer Parameterizations in Simulating a Heavy Rainfall Event using Different Microphysical Schemes. Effect on Large-Scale Processes. Atmospheric Research 132-133: 125-143.  Lolis CJ. 2012: High-resolution precipitation over the southern Balkans. Climate Research 55: 167-179.  Lolis CJ, Bartzokas A, Lagouvardos K, Metaxas DA. 2012: Intra-annual variation of atmospheric static stability in the Mediterranean region: a 60-year climatology. Theoretical and Applied Climatology 110: 245-261.  Houssos ΕΕ, Lolis CJ, Gkikas A, Hatzianastassiou N, Bartzokas A. 2012: On the atmospheric circulation characteristics associated with fog in Ioannina, North-Western Greece. International Journal of Climatology 32: 1847-1862.  Sanchez-Lorenzo A, Pereira P, Lopez-Bustins JA, Lolis CJ. 2012: Summer night-time temperature trends on the Iberian Peninsula and their connection with large-scale atmospheric circulation patterns. International Journal of Climatology 32: 1326-1335.  Papadimas CD, Bartzokas A, Lolis CJ, Hatzianastassiou N. 2012: Sea level pressure – air temperature teleconnections during northern hemisphere winter. Theoretical and Applied Climatology 108: 173–189.  Lolis CJ. 2012: Winter convective precipitation variability in south-eastern Europe and its connection to middle tropospheric circulation for the 60-year period 1950-2009. Theoretical and Applied Climatology 107(1): 189-200.  Bartzokas A, Azzopardi J, Bertotti L, Buzzi A, Cavaleri L, Conte D, Davolio S, Dietrich S, Drago A, Drofa O, Gkikas A, Kotroni V, Lagouvardos K, Lolis CJ, Michaelides S, Miglietta M, Mugnai A, Music S, Nikolaides K, Porc`u F, Savvidou K, Tsirogianni MI. 2010: The RISKMED project: Philosophy, methods and results. Natural Hazards and Earth System Sciences 10: 1393-1401.  Bartzokas A, Kotroni V, Lagouvardos K, Lolis CJ, Gkikas A, Tsirogianni MI. 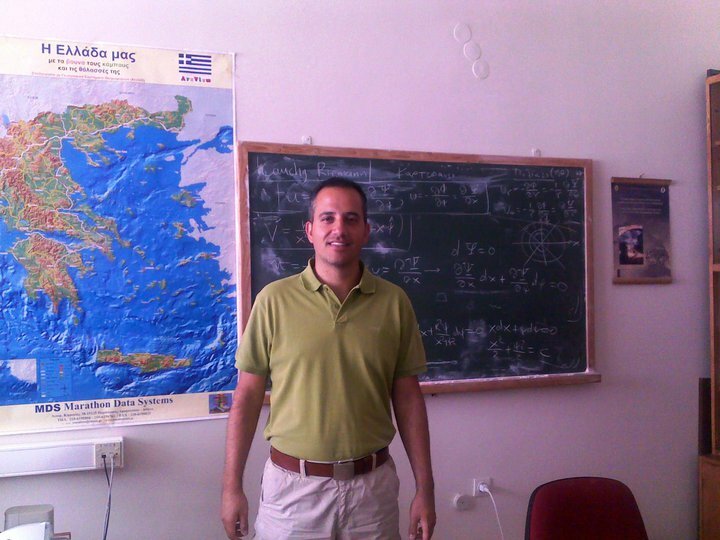 2010: Weather forecast in NW Greece; verification of MM5 model and RISKMED warnings. Natural Hazards and Earth System Sciences 10: 383-394.  Houssos EE, Lolis CJ, Bartzokas A. 2009: The main characteristics of atmospheric circulation associated with fog in Greece. Natural Hazards and Earth System Sciences 9: 1857-1869.  Metaxas DA, Bartzokas A, Lolis CJ, Philandras CM. 2009: Contribution to the seasonal air temperature forecast in the northern hemisphere; a statistical approach. Fresenius Environmental Bulletin 18(3): 253-260.  Lolis CJ. 2009: Winter cloudiness variability in the Mediterranean region and its connection to atmospheric circulation features. Theoretical and Applied Climatology 96(3-4): 357-373.  Houssos EE, Lolis CJ, Bartzokas A. 2008: Atmospheric circulation patterns associated with extreme precipitation amounts in Greece. Advances in Geosciences 17: 5-11.  Lolis CJ, Metaxas DA, Bartzokas A. 2008: On the intra-annual variability of atmospheric circulation in the Mediterranean region. International Journal of Climatology 28: 1339-1355.  Lolis CJ. 2007: Climatic features of atmospheric stability in the Mediterranean region (1948-2006): spatial modes, inter-monthly and inter-annual variability. Meteorological Applications 14: 361-379.  Houssos EE, Lolis CJ, Bartzokas A. 2007: The atmospheric conditions over Europe and the Mediterranean, favoring snow events in Athens, Greece. Advances in Geosciences 12: 127-135.  Lolis CJ, Bartzokas A, Katsoulis BD. 2004: Relation between sensible and latent heat fluxes in the Mediterranean and precipitation in the Greek area during winter. International Journal of Climatology 24: 1803-1816.  Kassomenos PA, Sindosi OA, Lolis CJ. 2003: Seasonal variation of the circulation types occurring over southern Greece: A 50-year study. Climate Research 24: 33-46.  Bartzokas A, Lolis CJ, Metaxas DA. 2003: The 850 hPa relative vorticity centres of action for winter precipitation in the Greek area. International Journal of Climatology 23: 813-828.  Kassomenos PA, Sindosi OA, Lolis CJ, Chaloulakou A. 2003: On the relation between seasonal synoptic circulation types and spatial air quality characteristics in Athens, Greece. Journal of the Air & Waste Management Association 53: 309-324.  Bartzokas A, Lolis CJ, Metaxas DA. 2003: A study on the intra-annual variation and the spatial distribution of precipitation amount and duration over Greece on a 10 day basis. International Journal of Climatology 23: 207-222.  Lolis CJ, Bartzokas A, Katsoulis BD. 2002: Spatial and temporal 850 hPa air temperature and sea-surface temperature covariances in the Mediterranean region and their connection to atmospheric circulation. International Journal of Climatology 22: 663-676.  Danielides V, Nousia Ch-S, Patrikakos G, Bartzokas A, Lolis CJ, Milionis HJ, Skevas A. 2002: Effect of meteorological parameters on acute laryngitis in adults. Acta Otolaryngologica 122: 655-660.  Danielides V, Nousia Ch-S, Bartzokas A, Lolis CJ, Kateri M, Skevas A. 2002: Weather conditions and sudden sensorineural hearing loss. BMC Ear, Nose and Throat Disorders 2: 2 (http://www.biomedcentral.com/1472-6815/2/2).  Danielides V, Kontogiannis N, Bartzokas A, Lolis CJ, Skevas A. 2002: The influence of meteorological factors on the frequency of epistaxis. Clinical Otolaryngology 27: 84-88.  Lolis CJ, Bartzokas A. 2001: Winter temperature covariances in the middle and the lower troposphere over Europe and the North Atlantic Ocean. International Journal of Climatology 21: 679-696.  Danielides V, Patrikakos G, Nousia Ch-S, Bartzokas A, Milionis HJ, Lolis CJ, Skevas A. 2001: Weather conditions and Bell's palsy: five-year study and review of literature. BMC Neurology 7 (http://www.biomedcentral.com/1471-2377/1/7).  Lolis CJ, Bartzokas Α, Metaxas DA. 1999: Spatial covariability of the climatic parameters in the Greek area. International Journal of Climatology 19: 185-196.